Traditional in design and modest in scale, the elegant Homelegance Mayville.. Item Number : 04166Feature : CHESTDimensions : 32" x 17" x 4.. Item Number : 04996Feature : DARK WALNUT CHEST W/5 DRAWERSDimensi.. Item Number : 08947Feature : MAPLE CHEST W/5 DRAWERSDimensions :&.. 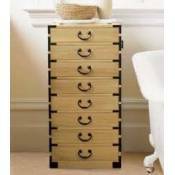 Item Number : 09157Feature : WH 5-DRAWER CHESTDimensions : 3.. Without a doubt this 3-piece bedroom set featuring a nightstand, mirror, ch.. Product DetailsAlpine Furniture Winchester 5 Drawer Chest White Finish Pine.. Product DetailsAlpine Furniture 1468-05 Newberry 5 Drawer Chest Salvaged Gr.. Product DetailsAlpine Furniture 1500-05 Charleston 5 Drawer Chest Antique G.. Product DetailsAlpine Furniture 1519-05 Silver Dreams 5 Drawer Chest Mirror.. Product DetailsAlpine Furniture 1600-05 Austin 5 Drawer Chest Chestnut Fini.. Product DetailsAlpine Furniture 1655-04 Monarch 3 Drawer Chest Grey Wood Bl.. Product DetailsAlpine Furniture 1655-05 Monarch 5 Drawer Chest Grey Wood Bl.. Product DetailsAlpine Furniture 1688-05 Madison 8 Drawer Chest Dark Espress.. Product DetailsAlpine Furniture 1788-05 Legacy 5 Drawer Chest Black Cherry .. Product DetailsAlpine Furniture 1800-05 Camilla 5 Drawer Chest Antique Grey.. Product DetailsAlpine Furniture 1888-05 Urban 6 Drawer Chest MerlotFeatures.. Item Number : 19506Feature : BK L.P CHESTDimensions : 32"x18.. Item Number : 19526Feature : CHERRY L.P CHESTDimensions : 32.. Item Number : 19546Feature : CAPPUCCINO CHESTDimensions : 34.. Item Number : 19576Feature : MADISON ESPRESSO CHESTDimensions :&n.. CALL 510 541 8602 FOR 40% OFFOffering an unfettered transitional styling, L..
Model Number: 200420Dimensions:Width: 17.75 x Depth: 42.25 ..
Model Number: 201655Dimensions:Width: 35.5 x Depth: 17.5 .. Item Number : 20196Feature : CHESTDimensions : 36" x 19" x 5.. Finish Color CAPPUCCINOWood Finish CAPPUCCINODescription	Width	Depth	Heigh.. Finish Color WARM BROWNWood Finish WARM BROWNDescription	.. Item Number : 20246Feature : CHESTDimensions : 33" x 18" x 5.. Item Number : 20256Feature : CHESTDimensions : 33" x 18" x 5..
Model Number: 202885Dimensions:Width: 38 x Depth: 18.75 x.. Finish Color RICH BROWNWood Finish RICH BROWNDescription	.. Item Number : 20396Feature : CHESTDimensions : 36" x 19" x 5.. Item Number : 20406Feature : CHESTDimensions : 31" x 16" x 4..